I am thinking of planning a 2 week holiday on the great river ouse system, using bridge boatyard at Ely as the start point. shropshire union, so I think I know my way round a boat, well just a little bit ! ! dangle a line for the odd unfortunate fish ! ! ! Any tips or info would be of great help. and many thanks for reading. We would highly recommend the Five Miles from Anywhere. This was our favourite pub by far from our visit that way. The boats at the Bridge yard looked very well turned out but they were older boats. We did find moorings a bit limited when we visited the Fens. The locals seem to like to spread themselves out a bit shall we say. I`ve seen that pub on the " maps " app and it looks good. We`ll be sure to visit. Are the locks down there manual or as we hope automatic ? Old Ferry Boat at Holywell its a GK pub like no other, mooring outside. but I`ve had to do the W word this afternoon. the fun stuff seems to be towards Bedford and cambridge. desposal ( bins ) down there ? Having 2 weeks down there you`ve got to think of these things ! ! ! Yes we enjoyed it in the Jenyns Arms at Denver and also the The Ship Inn a bit further upstream. I wouldn't call it desolate but it was certainly a lot quieter than the Broads. We didn't have a problem with filling up with water (and we have a small tank) or disposing of rubbish. It was one of our more relaxing holidays we have taken. Well this may be out of date by now, but, here's a selection from my 2014 Pub Cruise:. Edited to say that the first two numbers are for beer choice and quality and the third is for everything else (but not food). JENYN'S ARMS, Denver Sluice 3+4+7=14 Great situation, rather large & food-oriented. FOUNTAIN, Ely 4+4+5=13 Expensive and empty. Bored barmaid. WEST END HOUSE, Ely 4+4+8=16 Found it eventually! CUTTER INN, Ely 3+2+5=10 Driven in by a sudden thunderstorm. MINSTER TAVERN, Ely 4+3+6=13 Large impersonal town centre bar. MAID'S HEAD, Wicken 3+4+8=15 From Wicken Fen mooring. A beautiful pub. LAZY OTTER, Old West River 4+4+8=16 A nice surprise. Depends on the caravan park. OLD FERRY BOAT, Holywell 4+4+7=15 A very busy pub, but staff helpful. OLIVER CROMWELL, St Ives 3+3+6=12 Taken over by yoof. Beer not what it was. ROYAL OAK, St Ives GBG 4+4+7=15 An average to good pub. AXE & COMPASS, Hemingford Abbots 3+3+6=12 Rather disappointing. Poor service. SWAN, Offord Cluny 1+2+2=5 A spartan retro barn. One poor beer. Landlady pleasant! HORSESHOE, Offord D'Arcy. 3+4+7=14 Much better, reflected in the price of the beer! BARLEY MOW, Hartford 3+3+4=10 I missed The King of the Belgians, dammit! RIVERMILL TAVERN, Eaton Socon 4+3+7=14 OK, but not as good as I remembered. I think we`ll book it and give it a try, why not ? It`s only money ! ! ! bigger than an ormelite ! ! ! (or fish bits ) on top of your chips ? We love a good chippie ! ! Thats quite a list of pubs ! ! ! We`ll be sure to try them ! You missed The Falcon in Huntingdon which has at least 13 real ales on sale or, if you dont want to walk too far, The Old Bridge has its own moorings and very well kept ale, albeit a bit expensive. You can moor very close to the town centre, if there is space. Otherwise plenty of space at Waterbeach and get train in. Or, there is a new GOBA mooring by Baits Bite Lock but I've never been there. Alternatively, if you are heading upstream to St. Ives, then the guided bus is best. Ely Cathedral. Best to climb the Octagon rather than the main tower, to see the 1,000 year old tree trunks. Prickwillow museum of fenland drainage, River Lark. Grimes Graves, neolithic flint mine, 2 miles from Brandon, Little Ouse. A few waterside pubs, but it's not the greatest set of waterways for that. I like the isolation and quiet moorings. Worth checking if you are allowed to use the GOBA moorings (the boatyard may have a business membership). If so then would highly recommend Wicken Fen. Worth checking if a licence for the Cam is included. Cambridge is not a particularly great place to visit by boat, except in the winter when you can go right through the centre (but not on Sundancer! ), so maybe best to catch train from Waterbeach, or guided bus from St Ives as noted above. I use the Imrays guide which is a good read if a little idiosyncratic. There is a fairly recent Pearsons guide but I have not read it. There's also the Ship (confluence of Little Ouse and Great Ouse). the Swan at Littleport, one at the head of the Lark at Jude's Row (name escapes me for now), and several grotty ones in Brandon. And I meant to say that (if you go through the second lock at Denver) you can get to Downham Market, nice town and also an easy train hop to Kings Lynn. Brampton and Godmanchester worth a visit too. In summary, I would say that the Bedford Ouse (from Bedford to Earith) is a pretty fairly standard river navigation. The Ely Ouse system is essentially a man-made land drainage system, lots of wildlife, with the land below the level of the river. Don’t neglect the Ouse tributaries when planning your trip - the Wissey in particular is beautiful. The Lodes are fascinating - you can moor at Burwell and enjoy a walk in a unique landscape to Wicken (NT cafe and visitor centre). It all depends what you want from your holiday really. Yes, the ones that people say I missed, I have generally have visited, but on trips before I started scoring and commenting on pubs in these pages. Well worth a run to Bedford, plenty do from Ely though Im fairly sure you wont get into the last lock as your headroom will be to high. Loads of pubs at St Neots, good pub/restaruant at Brampton, Great Barford and Bedford (riverside one near Cardington). My favourite mooring is on the Island at Barford if you want peace and quiet. 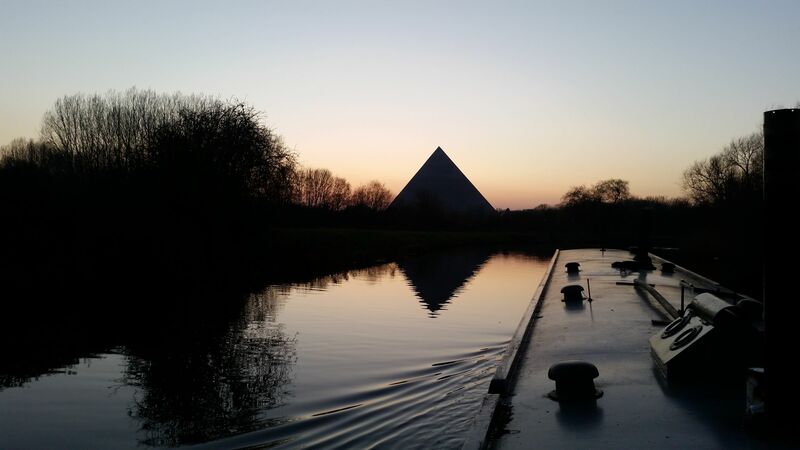 Many dont rate Bedford-well I will admit its not beautiful, River is though,always plenty of moorings and the only place I know were you can moor near a pyramid!